HyperSmash Hues N Blues: Rainbow Eyes! Hello everyone! 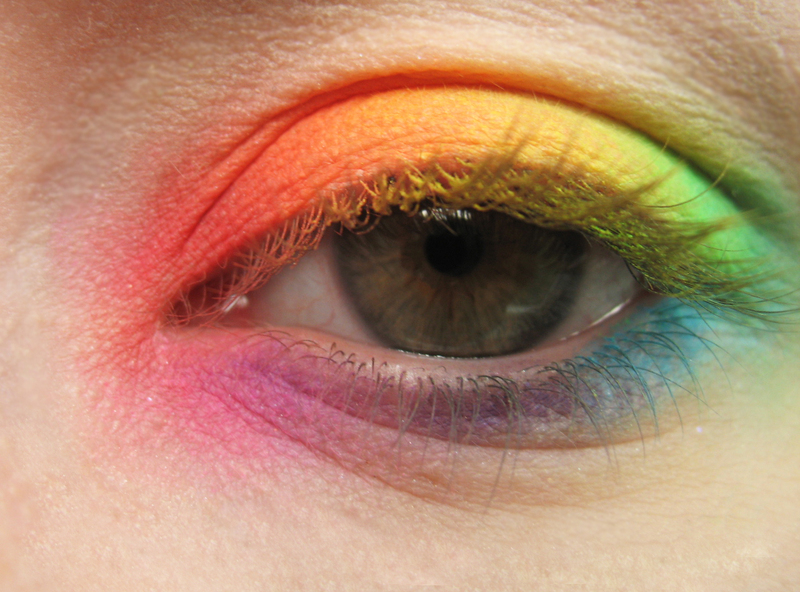 Today I felt like playing with make-up so I attempted my own version of a rainbow eye. 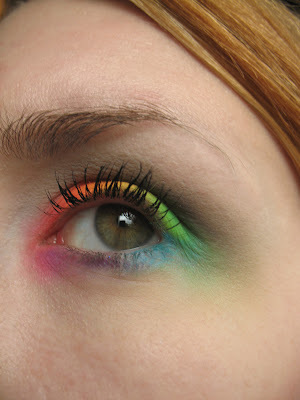 I know it's similar to things I have done in the past but this is my first time doing a true rainbow on the eye. I photographed it without mascara or any black/grey first because I like how bright and 'clean' it looked, but the lashes do look a bit weird with all that fallout on haha. In the last picture the lower lashline looks really unblended but it didn't look that bad in real life I swear! Sleek Acid and Curacao palettes. Oh i like this one a lot !!! So gorgeous !! Awesome! I love how bright it is! I totally love neon colors, and sometimes I wish they could exist in shimmery tones as well. And I really like that first picture you took without mascara, because sometimes you really take of the edge by applying mascara. Sometimes I want it naked and raw, but as one would want to go out you couldn't keep everyone from looking at you like a freak without mascara!!! OMG, I LOVE THIS! The darkened crease really pulls it all together! EOTD: It only hurts when I mauve!